It is estimated that latitudes of France about 45 ° potentially usable energy from the sun is a year 1500kwh / m². See the map French ensoillement and I'solar radiation DNI of France. With current yields approximately 10 to 15% is obtained at 150 225kwh / m².an. Solar panels called "non integrated". 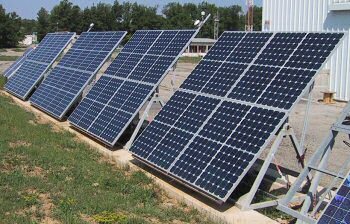 A photovoltaic cell is composed of semiconductor materials. These are capable of transforming the energy supplied by the sun into electrical load thus electricity because sunlight excites the electrons of these materials. The absorption curve of these materials begins low wavelengths up to a boundary wavelength which is 1,1 micrometers for silicon. Silicon is the main component of a photovoltaic cell. Operating diagram of a photoelectric cell. Silicon was chosen for the photovoltaic solar cells for its electronic properties, characterized by the presence of four electrons in its outermost shell (column IV of the table Mendeleev). In the solid silicon, each atom is bonded to four neighbors, and all the electrons of the outermost shell participate in the bonds. If a silicon atom is replaced by an atom from column V (phosphorus, for example), one of the electrons does not participate in bonds; it can thus move in the network. There electron conduction, and the semiconductor is said n-type doped. If instead a silicon atom is replaced by an atom of column III (boron for example), it lacks an electron to carry out all the links, and an electron can come fill this gap. We say that there is conduction through a hole, and the semiconductor is said p-type doped. Atoms such as boron or phosphorus are doping silicon. When an n-type semiconductor is brought into contact with a p-type semiconductor, excess electrons in the n material diffuse into the p material. The area initially doped n becomes positively charged and initially doped p area becomes negatively charged. It therefore creates an electric field between the zones n and p, which tends to push electrons in zone and an equilibrium is established. A junction was created, and by adding metal contacts on the n and p is a diode which is obtained. When this LED is illuminated, photons are absorbed by the material and each photon gives rise to an electron and a hole (known as electron-hole pair). The diode junction separates the electrons and holes, creating a potential difference between the n and p contacts, and a current flows if a resistor is placed between the contacts of the diode (Figure). silicon single crystal: the photovoltaic cells are based on silicon crystals encapsulated in a plastic envelope. polycrystalline silicon: The photovoltaic cells are based on silicon polycrystals, less expensive to manufacture than monocrystalline silicon, but also have a somewhat lower yield. These polycrystals are obtained by melting scrap of electronic grade silicon. amorphous silicon: "spread" panels are made of amorphous silicon with high energizing power and presented in flexible strips allowing a perfect architectural integration. The five largest companies manufacturing photovoltaic cells share 60% of the global market. These Japanese companies Sharp and Kyocera, BP Solar US companies and Astropower, and the German RWE Schott Solar. Japan produces almost half of the photovoltaic cells in the world. Currently the main areas of application are isolated dwellings but also for scientific devices such as seismographs. The first area to have used this energy is the space field. Indeed, all the electrical energy quasiement satellites is provided by the photovoltaic (some satellites have small engines stirling). Be used in countries without significant channel grid development or in remote locations such as in mountain where it is not possible to connect to the national grid. 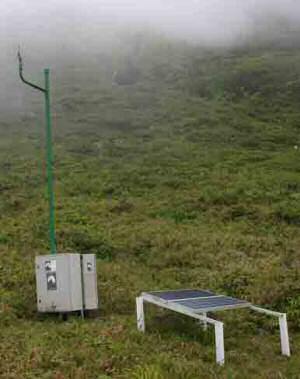 Example of power-grid, powered by a seismograph photovoltaic panel of the Soufriere volcano in Guadeloupe. The same end of life recycling of cells poses environmental problems.